Energy Bites loaded with salty-sweet flavors and textures? Pretzels? Toasted coconut? Peanut butter and oats and chia seeds? This is right where we wanna be. This post is sponsored by Wholesome!®. 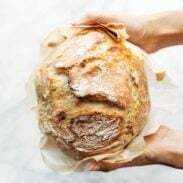 And the good news for those of us who love conveniences such as packing all the good snacks – health wise and taste wise – into one little treat that you can take on the go and eat in three bites is that THIS ENERGY BITES RECIPE WAS MADE FOR YOU. Let me just paint the picture. It’s a Thursday or Monday or any old night. You worked a long day. You made a nice dinner – orrr maybe picked up Thai curry for takeout / judgement free zone – and now you’re ready to settle in for the night with Netflix and a _____. But what is the ____? It’s a treat, probably, although not *too* much of a treat because it’s just a Thursday night and you don’t want to go crazywild with it since you’ll go out on Friday or Saturday, but seriously, just a few bites of a little sweet-ish snack would be the perfect thing and please actually can someone bring that almost empty ice cream container and the bag of chocolate chips in here? And then it’s Saturday afternoon and you’d really love to make a fun snack for those hungry hours between brunch and dinner but you also have a major nap on the agenda so time is limited here, people. Your jam right now is something that comes together without any special trip to the store and without a ton of fussy prep and with zero wait-time before you can eat it. This maybe makes us sound more desperate than we really are (right…?) but this is a situation that requires immediacy. No time to wait. Hangry alarms are ringing. If I haven’t made this so super clear yet, I am of the mindset that a two-bite sweet snack after a meal or between meals or, let’s be honest, BEFORE meals sometimes makes everything right in the world. No need to go full blown piece-of-pie on me. I’m not looking for a quadruple scoop ice cream cone with all the toppings. All I need is literally a few little bites of something good to just make my mouth feel happy – and if it could be something that is also nutritious and real food and energy-giving, that would be my vision of practical-meets-healthy-meets-omg-delicious food heaven. We’ve cracked the code on this dilemma. These energy bites are similar to lots of the other energy bites you’ll find on the internet, except also not. There are a few key differences. Shredded coconut. Unsweetened and toasted plz. Pretzels bc TEAM SALTY SWEET! Also because usually I have at least one random box of cereal or crackers or salty snacks like pretzels sitting around that is needing to find a home within a recipe. This is its moment to shine. Oats – but not just plain oats (honestly, how do people eat them raw when they’re so big and chewy? I struggle.) – we run these through the food processor first for better texture. It’s the little things. Ch-ch-ch-ch-chiiiia seeds. Those soft little crunchies up in there make the whole thing. Seriously. Coconut oil – I still can’t let go of the texture of these babies. Agave – Wholesome!® does it right with organic, fair trade, and non-GMO agave goodness. I love honey, for sure, but agave = hello vegan energy bites! The texture incorporates easily and also the simple sweet flavor is perfection. And just like that, we have ourselves the solution we’ve been looking for: a two-bite quick and easy energy bite snack that comes together with just about any ingredients you have on hand and keeps soft and delicious in the fridge for many weeks and packs in a little mini nutritional boost to give you energy which is why these are called ENERGY BITES. We are just a little obsessed over here. Energy Bites! 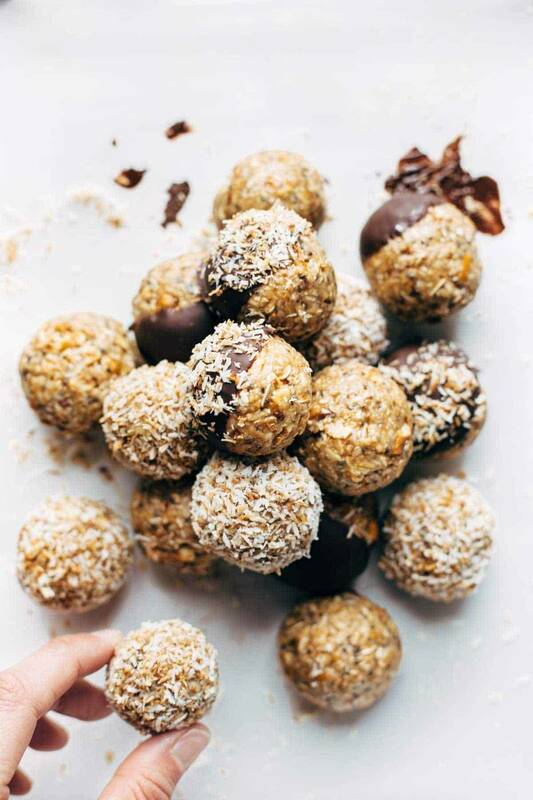 Easy no-bake recipe with real food like oats, chia seeds, peanut butter, and coconut. Stays soft and yummy for weeks in the fridge! Pulse the oats and pretzels through a food processor (one ingredient at a time) to get a more uniform chopped texture. I usually give each about 15 quick pulses. You want the texture to be “crushed” – somewhere between whole and completely ground. Mix all ingredients together until combined. Shape into balls (it helps to squeeze them to stick together) – usually I can get 20-25 with this recipe, depending on how many I eat during the shaping process. Chill in the fridge or freezer for 20-30 minutes. Done! I keep these in the freezer so they last longer and hold their shape nicely but they do well at room temperature for a day or two as well. I used unsweetened coconut. To make them prettier, roll them in a little bit of toasted coconut or dip in chocolate. Thanks to Wholesome!® – makers of this Organic Blue Agave – for partnering with us for this post! And for being a great brand all-around. These remind me of those delicious granola bars you have on here (which I LOVE)! Definitely need to give these a try! These look stinkin’ spectacular!! Anything with pretzels call my naaaaammmmeee! Its like you were in my head this week. I’ve been thinking and dreaming of some sort of protein type bite to tide me over. And I gotta say without being too much of a fan girl… your writing… dang girl. Keeps me giggling and coming back every week! Thanks for the sweet comment! 🙂 Hope you enjoy them! Salty and sweet combo is without a doubt my favorite combination! And the soft and crunchy of this energy bite I think might be my favorite part! It’s the best part about it! 🙂 Hope you enjoy! These sound great – I love the salty sweet combo as well. One question – can you remove the shredded coconut and keep the consistency? I am one of those people that do not like the feeling/taste of shredded coconut, I don’t mind the coconut oil though. Should be fine! If you omit it, I would just replace it with more oats or pretzels to keep the amount of dry ingredients the same. Oh heck yeah! Salty and sweet is a combo that is hard to resist – I need snacks like this to tide me over between brunch and linner, between breakfast and lunch errryday! That’s the goal! 🙂 Hope you enjoy them! Hi Lindsay ! Those look so good, can’t wait to make them ! I am a lover of sweet & salty treats, and I am addicted to coconut oil. Those were made for me ! Also, I just purchased your ebook, and I am so excited ! I can’t wait to start it, thanks so much for your beautiful blog and great resources. Thanks for the comment, Audrey! Hope you enjoy them! I’m making these TO-DAY! p.s. Technical photography question: natural or artificial lighting on bites??? Interesting how things work–I had Thai green curry for lunch yesterday, hahaha! These peanut butter pretzel energy bites look irresistible! Peanut butter goes well with anything, but with salty things? Oh my gosh. I just made these with a few slight modifications because I wanted to use what I had on hand. I used honey because I had no agave, and my coconut was sweetened. Oh and my pb was flavored: cinnamon raisin. I had a hard time with the mixture sticking to my hands,. By wetting my hands, I was able to get them to roll easier. Thank you for this great recipe. These things are addictive! Thanks, Athena! 🙂 Glad to hear you enjoyed them! Yummy, i had made these very similar and delicious. I might give yours a try though, my fiancee loves PB and pretzels. I love all your recipes and I’m sure this one will be wonderful also. Is one serving just one ball? I assume it is but I’d rather be one serving is 20-25 of them! Oooh! I love energy bites! Absolutely a wonderful snack when you want just a little sumpin sumpin between meals. My husband loves pretzels, so I’ll have to give these a try! Thanks for the recipe! I just made these with my 3-year-old and they are yummy. The mixture was very crumbly and almost impossible to form into balls so I added more PB. I think chilling them for 5 minutes (or so) BEFORE rolling would help. Thanks! Hi this is Barbara your SLC Lyft driver. Have enjoyed your blog so much. It has wonderful pictures and information. Great job. You have some great recipes that I am looking forward to trying. You get 5 stars. Love the low sugar content and pretzels. Can’t wait to try. Hey Lindsay! You should’ve called these fun bites instead 🙂 healthy and gorgeous. Hi Lindsay I have just mixed the ingredients but it is impossible to make the balls…taste-wise it’s heaven and I will maybe eat the whole thing as it is:-)any tricks to avoid the stickiness? I had the same problem, so I dampened my hands with cold water and patted tightly! You might need to re-dampen multiple times! I couldn’t get them to make balls either! They wouldn’t stick no matter what! Help! Hi Dana! We’ve found that adding a little bit more peanut butter helps if you’re having trouble getting them to stick together. I made these yesterday – my tip is to use a small ice cream scoop! Pack the ingredients in with your palm and release! Ugh, I’m not putting ‘energy bite roller’ on my resume anytime soon. Just couldn’t get them to form into balls or stay together at all. So I popped the whole works in the oven and ended up with some amazing granola… redemption!! Glad it still worked out, Jennifer! Great idea. 🙂 If you give it another shot, we’ve found that adding a little bit more peanut butter helps if you’re having trouble getting them to stick together. Hi Lindsay! Just made these and they tasted delicious. Can’t wait to have them at work tomorrow! Question for you though, lately I’ve been feeling very conflicted towards Agave. Do you personally think Agave is a good sugar substitution? People are put off by the “fructose” but then it’s suppose to be better than sugar because you can use less of it. Hi Kate! This page on Wholesome’s website addresses this and is a great resource: http://wholesomesweet.com/faqs-knowledgebase/agave-fact-vs-fiction/. Hope that helps! 🙂 Thanks for the comment!